COSJET SR is an excellent laser system with two wavelengths of 1064nm and 1320nm. 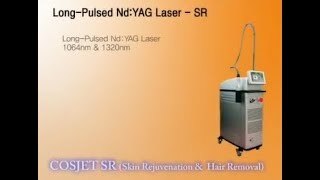 Genesis Mode, hair removal with vascular lesions with stable & strong output energy. Contacting cooling system and SCS Cryo gas in COSJET SR would be definitely a great cooling solution during treatment. 1320nm is also one of the best wavelength for Acne treatment. the treatment during a great Long Pulsed treatment. target vein laser penetration depth varies upon spot size and pulse duration.